Leaked data says unemployment is at a 45-year high. Will the damning numbers put the BJP government’s job on the line? The data, which the government says is unauth­enticated, becomes even more pronounced when viewed in the political context in an election year; in 2014, India’s aspirational youth voted overwhelmingly in favour of Narendra Modi who had promised to address the UPA era of “jobless growth” and create 20 million jobs every year. Archana, a native of Telan­gana’s Medak district, gradua­ted in 2017 in the science stream with distinction, which the 22-year-old thought was good enough to land her a moderately well-paying job. A few months later she was working as a “domestic help”, her dreams long broken by the harsh reality of India’s dismal job scenario. Her brother, four years older and also a graduate, was also into odd jobs—a delivery boy for Swiggy or part-time driver. Archana hopes to complete her post-graduation which she feels could give her a better chance at landing a job. Any job. An individual is not representative of job-seekers in a country where there are millions. 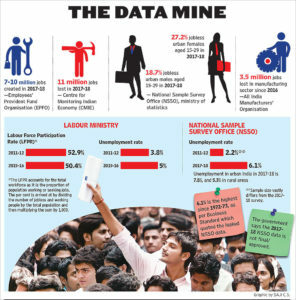 But held against recently leaked data on the number of unemployed, Archana beco­mes a stark reminder of a growing crisis—India’s unemployment rate in the year ending June 2018 supposedly rose to 6.1 per cent, the highest in 45 years (see graphic). What it means is that the available jobs can provide employment to hardly 10-15 per cent of the millions of young Indians ready to enter the labour force each year. The data, which the government says is unauth­enticated, becomes even more pronounced when viewed in the political context in an election year; in 2014, India’s aspirational youth voted overwhelmingly in favour of Narendra Modi who had promised to address the UPA era of “jobless growth” and create 20 million jobs every year. Nearly five years later and close to the next general elections, Modi himself is fending off criticism from political adversaries over the unemployment data his government allegedly tried to bury. The leak of the unemployment data followed the resignation of the top official and another member of the National Statistical Commission—an advisory group that checks auth­enticity of official data— to protest the government’s failure to release the report in December, as scheduled. The NITI Aayog, a government think tank formed in 2015 by Modi replacing the Nehru-era Planning Commission, has dismissed the leaked report as a “draft” but there are other numbers that are equally damning. Last month, the Centre for Monitoring Indian Economy (CMIE), an independent think tank, said India lost an estimated 11 million jobs in 2018. The All India Manufacturers’ Organisation also said in December that the sector alone lost 3.5 million jobs since 2016, citing demo­netisation and roll-out of the Goods and Services Tax (GST) as the two main reasons for the crisis. Dr Pronab Sen, a former chief statistician of India, says that the leaked data is not surprising. “I was certainly expecting the numbers to go up as we know that the MSME sector has been hurting for a while. The unemployment number is consistent with that particular nar­rative,” he tells #KhabarLive. 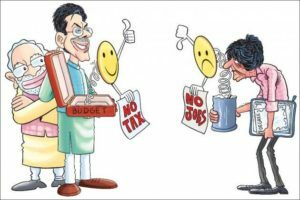 Reuters quoted a survey by the All India Trade Union Congress (AITUC) in July last year as saying that “a fifth of India’s 63 million small businesses—contributing 32 ­per cent to the economy and employing 111 million people—faced a 20 per cent fall in profits since the GST rollout, and had to sack hundreds of thousands of workers”. The government, however, does not see any crisis, pointing to the more-than-seven per cent growth—the fastest among major economies—of the Indian economy. Dharmendra Pradhan, Union minister for skill dev­elopment and entre­preneurship, too rubbishes the leaked National Sample Survey Organisation (NSSO) data. “There is no authenticity to this information. If some people have cooked up some repo­­rt and they put their ima­gination, I do not have any ans­wer,” he tells #KhabarLive, blaming “negativity in a micro­scopic group” of people behind what he claims is a smear campaign against Modi. For the record, since the NSSO started collating job data, the earlier highest unemployed percentage was in the range of four-and-a-half to five per cent. The labou­r ministry releases jobs data once in five years and the last official report pegged unemployment at 5 per cent in 2015-16. Last year, the government relea­sed data from the pension fund body, Employees’ Provident Fund Organisation, to claim that 7-10 millions jobs were created in 2017-18. 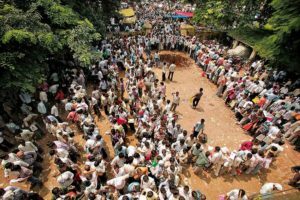 Critics have, however, accused the government of using EPFO data to inflate job growth. Dr Vinoj Abraham of the Centre for Development Studies, for one, is surprised by the latest numbers as he was not expecting “so much” unemployment. He, however, adds that the final numbers, if and when released officially, could vary. While a higher number of youth below 25 are entering the work force, it cannot be the real reason for the rise in unemployment rate as the young ones entering the labour market today are unlike those who entered the job scene in the previous decades, he says. “Today, most of the youngsters are moving out from the agriculture sector with expectations of a non-farm job. The fact that there are not many such jobs to absorb the newcomers is a problem,” Abraham adds. Moumika Mondal (24), a native of Murshidabad in West Bengal but based in north Calcutta, says her post-graduate degree in Applied Microbiology has few takers in the market. After completing her studies in 2017, she worked in a private company but quit as it entai­led only data entry. “There are not many jobs of microbiologists in the government sector and the very few that are there, want to employ doctors with experience,” adds the daughter of a retired banker. Mukesh Kumar of a Sikar, Rajasthan will officially qualify as employed, working as a teacher at a local private college. But with irregular salaries—“sometimes not paid for months”—the multiple degree-holder says he often lapses into depression. Married with children, Kumar says his full-time job now is to prepare and sit for competitive exams. Sabina Dewan, president and executive director of JustJobs Network, says that most people work in the informal sector, which employs over 90 per cent of the wor­kforce and people don’t have the option not to work. “Everybody has to engage in some kind of economic activity as their survival depends on it. But can that be called a just job when it cannot meet your family’s basic needs? So the idea that we have been having high GDP growth and low unemployment has been a false narrative…The high GDP growth has not translated into high jobs growth for most people,” she adds. A recent study by UNICEF India and JustJobs Network found that more than 18 per cent of graduates in the 18-29 age group are unemployed, out of which more than 58 per cent reported “job skill mismatch” as the biggest reason. While the Centre continues to face the brunt of criticism, states have not done their bit too to ease the problem. Take Odisha, for instance. The state has 1.5 lakh vacancies in the government but it has shown no urgency to recruit. But it acted with great alacrity in hiring youth for the Biju Yuba Vahini (BYV), a scheme launched amid great fanfare last March to promote ‘voluntarism’ among the youth. Nearly three lakh youth have already been roped in as volunteers in 7520 BYV groups, each of them entitled to a grant of Rs. 1.5 lakh per year. CMIE data released last year show an overall unemployment rate of 6.6 per cent but the same for youth in the 15-29 years age group stood at a worrying 15 per cent. Unemployment rate was higher than the national average in respect of both educated and uneducated youth. What is of concern is that there are not too many jobs available in the private sector either. Despite its vast natural resources, Odisha remains among the least industrialised states in the country. The scope for employment of local youth in the few industries that have set up shop—mostly in the metallurgical sector— is very limited, partly because of the technical nature of most such jobs and partly due to reluctance of employers. This leaves the services sector as the only field that offers some jobs to the youth. Rourkela-based Dibakar Biswal, who is preparing for the Odisha Administrative Service, says the craze for government jobs “has to do primarily with the security of tenure and post-retirement benefits”. The scenario in other states is equally dismal. In West Bengal, “whatever jobs are there in the state, are mostly in the private and unorganised sectors,” says Ajitabh Roy Chaudhury, who teaches economics at the Jadavpur University. “The state government has not been able to enter the value chain in the manufacturing sector where more jobs can be created. The manufacturing sector, which provides a wider range of employment, has fallen in the state, giving rise to the unorganised sector that now employs mostly unskilled and casual workers.” And lack of official job data is particularly unhelpful in analysing the market, he adds. Government officials admit that there are not enough government jobs in the state for the large number of educated and skilled unemployed. 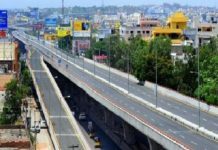 It’s very much the same in Andhra Pradesh and Telangana, both facing ­unemployment from a cash crunch, particularly due to the need to create governance infrastructure all over again. “Where are the government jobs? Even if they exist, where is the money? Unless the government creates environment for self-employment oppor­tunities through skill development and facilitate and encourages start-ups in all fields by providing infrastructure facilities, it would be difficult for any government to tackle growing unemployment problem,” says political analyst Brig (retd) GB Reddi. In Telangana, Chief Minister K.Chandrasekhar Rao is facing flak for failing to create the 1.5 lakh jobs he had promised. His government had also vowed to create 52 lakh direct and indirect jobs in the Information Technology sector. 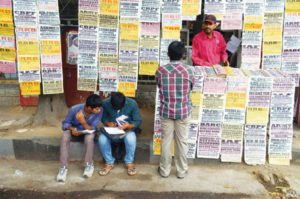 According to a member of the Osmania University students’ union, there are over 1.5 lakh posts vacant in various government ­departments when the new state was formed. But, recruitment exams for only 9,000 constable post and 100 group II post were conducted. 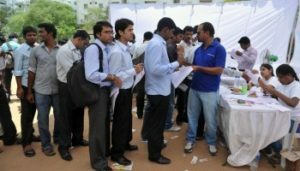 Telangana has the third-highest rate of unemployment among graduates in India, the CMIE report showed. 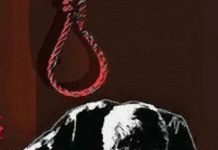 Perhaps the most pitiable condition is that of Jammu and Kashmir where the only jobs available are with the government in the absence of the private sector. Not surprisingly, the state has the highest government employee-population ratio in the country. But landing a government job in itself a Herculean task, pointed out in no uncertain terms by Governor Satya Pal Malik. “There is so much of fraud and those who don’t give bribe have no chance of getting a job,” he said recently. 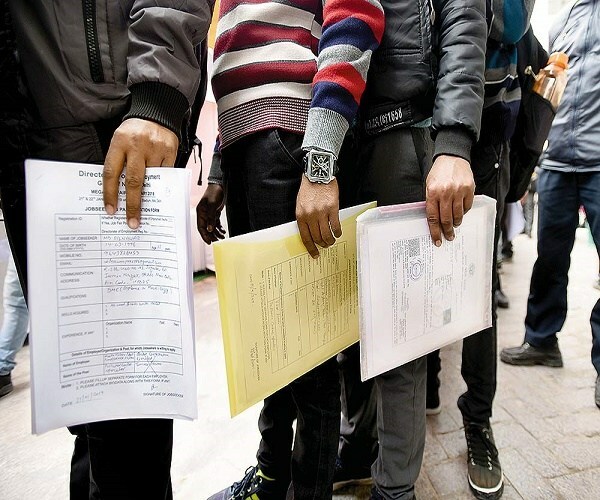 There is no clear data available regar­ding unemployed youth with the government though the number is believed to be around over 4 lakh. Unofficially, however, it is said to be around nine lakh. “J&K is a dependent economy. It heavily depends upon transfers from the Centre. At the same time, it is also a closed economy. 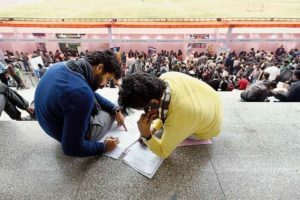 We are not connected with the outside world as other places, which has a direct impa­­ct on our economy and job prospects,” says Aijaz Ashraf Wani, assistant professor in the department of Political Science at Kashmir University. 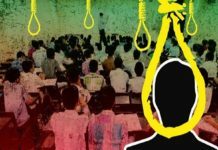 Many in Kashmir would like to blame successive governments at the Centre for the unemployment mess in the state where joblessness also feeds militancy. For the Opposition, however, the BJP government is responsible for the “mess” in the country at present. “The economy is up a creek without a paddle. The NDA government has the dubious distinction of actually shrinking the Indian economy and this is reflected in the fact that there is not only a loss of jobs, which the NSC report would have brought out. But more importantly, the number of people joining the labour force has also increased significantly in the 15+ age group which means that India will not be able to harness the demographic dividend. This is going to have long term structural effects on the Indian economy,” says Manish Tewari, Congress’s national spokesperson. Experts point out that high growth—often tom-tommed by the government to deflect criticism—does not necessarily translate into high job growth, for various reasons. But surprisingly in the earlier phase of high growth from 2003-04 to 2007-08 and extended with stimulus till 2011-12, India saw significant growth in employment generation including in manufacturing. Jayan Jose Thomas of IIT Delhi points out that in the present too, new jobs are being created but mostly in the informal sector. Thomas advocates going back to the basic and priority sectors to boost employ­ment. “We need to first look at the agriculture sector, particularly the agro-based industrial sector to study why value addition is so low. Similarly, much needs to be done to boost the manufacturing sector, which despite the Make in India initiative, has not shown adequate growth even in low technology, labour intensive industries. In fact, they have been slowing down,” Thomas adds. The growth in employment from 2004 till 2012 owed much to structural transformation with people moving from agricultural sector to urban sectors like services and manufacturing. Over the last few years, this transformation has slowed down very significantly, partly due to macro-economic shocks since the 2008 financial crisis followed by demonetisation that hit the informal sectors, fuelling real unemployment. It also hit people who were working to supplement other incomes like from the farm sector. Since 2008, even investments have declined, imp­acting employment linked to investments and growth. Experts agree that on the structural level there was a need to have economic transformation by making low productivity sectors like agriculture and manufacturing into high productivity sectors. This is important as over 44 per cent of the workforce is still employed in agriculture while 66 per cent of the population is based in rural areas. There is also a need to improve the quality of agriculture productivity while identifying more non-agricultural activities in rural areas to help in the transition as people move out of farm activities. Breaking away from the past practice of releasing unemployment data every five years, from this year onward the NSSO plans to release annual aggregate data alongside quarterly data on the urban job scene. The government believes that this would help policy makers to study and take prompt steps to boost employment generation. For the time being, however, the BJP-led National Democratic Alliance (NDA) has a far bigger task at hand—getting the people’s mandate for ­another five years. Faced with bruising electoral defeats in three heartland states—Madhya Pradesh, Rajasthan and Chhattisgarh—in the assembly elections last year, the Modi government rolled out a slew of programmes in the interim budget to quell growing farm unrest and pushback by the unemployed. 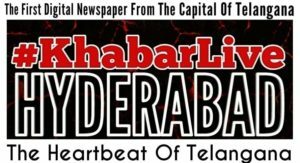 Previous articleWill The Films Are Only Way To Preserve Hyderabad’s Heritage?